DUG Insight User ManualFrequently Asked QuestionsFrequently Asked Questions PetrelHow do I send the Petrel message log? If you are experiencing problems working in Petrel with Insight, sending us your Petrel message log could help give us a better idea as to the nature of the problem. 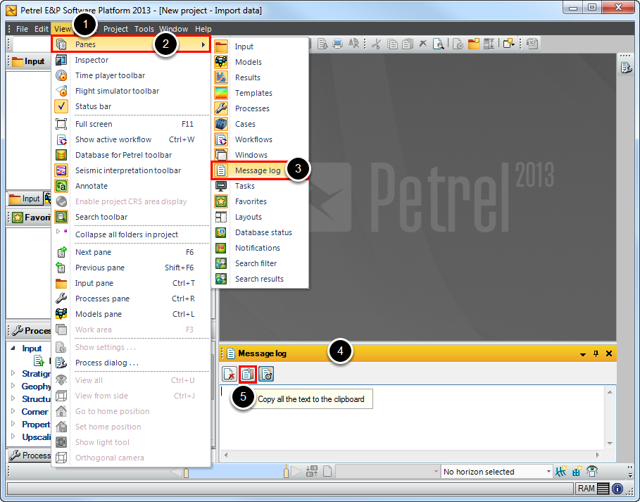 Follow the steps below to enable Petrel's message log, and copy the text inside. In Petrel, go to the View menu. Click on Message Log and make sure that it is toggled on. Locate the Message Log window. Click on the Copy text icon (second icon from the left at the top of the Message Log window) to copy all the text to the clipboard. Open your email and compose a new email. Address the email to support@dugeo.com. In the main body, right-click and select Paste, or press Ctrl + V on your keyboard to paste the text. If you have a support number, please indicate it in the subject. Write a brief description of the issue. The more we know about the problem, the easier it is for us to help you! Next: How do I export polygons from Petrel to import into Insight?